I was cruising along, doing that daily life thing, and I saw yet another label on yet another cosmetic product boasting “Paraben Free.” It wasn’t an empty or deceiving claim: The product’s manufacturer used a preservative system that doesn’t contain parabens. I see this same fear of parabens pop up in “crunchy living” Facebook groups and the occasional post, and I know where it originated. A 2004 study in Great Britain found parabens in breast tumors. The Environmental Working Group (EWG) grabbed the study and ran with it, using their agenda to push the federal government to ban parabens as dangerous, cancer-causing ingredients. The study was flawed, though. The group left out a very valuable component of solid scientific research: The control group. The British scientists failed to test healthy breast tissue to determine the amount of parabens present in non-cancerous tissue. In the thirteen years since that study came out, other scientists have conducted other studies, including those the Food & Drug Administration (FDA) employs. * The findings have been revealing. Parabens occur naturally in plants and in humans. In fact, a normal, healthy woman’s body can naturally have 10,000 times the amount of parabens as are found in a paraben-preserved product. Let’s look at another factor here. Parabens are naturally occurring. They show up in the body and in plants. (Japanese honeysuckle is sometimes used as a natural preservative in products, such as shampoo.) This is not something I’m going to freak out about. Why? I’m not putting it in my body. As I’ve said before, the skin is marvelous at keeping things out of the body; that’s one of its primary functions. The primary way that manufactured parabens could be hazardous is if we drank large quantities of them. Ew! How disgusting would that be?! 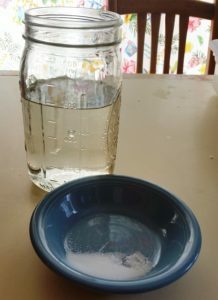 This image shows 20 ounces of water in the jar and 5 grams of salt in the bowl. The 5 grams represents how much preservative goes into 20 ounces (approx. 560 grams) of lotion. That fills 5 4-ounce tottles. When you’re trying to determine if something is worth panicking about, consider the source. I personally like the broad-spectrum protection that paraben-based preservatives give my products. There are, however, some non-paraben preservatives that are very close to equally as good that I’ve been using lately. I’ll tell you, “Hey, don’t worry about parabens,” and it’s not because I have some vested interest in the companies that manufacture these preservative systems or the labs that conduct the tests. I’ve done the research that not many people have any interest in doing and am simply passing those findings on to you, because my informing customers allows you to make informed buying decisions. At the same time, I could say, “Go ahead and avoid parabens.” Again, this isn’t because I have an agenda or a vested interest in the organizations or companies that support a ban on parabens. Interestingly enough, the companies that manufacture the paraben-based preservative systems also manufacture the paraben-free preservatives. If paraben use makes you feel uncomfortable for whatever reason, that’s fine, and it’s OK to use products that don’t contain parabens. If, on the other hand, you don’t care as long as nasty stuff isn’t growing in your body products and makeup, that’s fine, too. Regardless of how I feel about an ingredient or a product, I respect people’s right to use it or avoid it as they choose. For more information about why it’s important to preserve cosmetics, check out this article I wrote a few years ago. *Caveat: I’m not saying that the FDA is some infallible government agency that never messes up and never has an agenda impact it. However, in this case, I can’t see any agenda that would influence their research findings, as chemical manufacturers tend to make a variety of preservative systems. Posted on August 17, 2017 Categories Bath and Body, CosmeticsTags Cosmetics, Manufacturing, parabens, preservativesLeave a comment on Don’t Fear the Parabens! 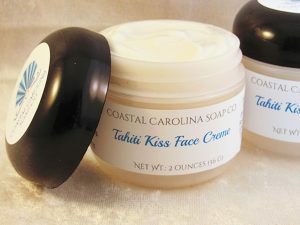 A few years ago I introduced Tahiti Kiss Face Crème, a custom formulated crème for all skin types. The initial reviews for it were brilliant, with everyone who tried it loving it. As I played around with formulas for this crème, I thought about what sort of scent to add, because plain, unscented lotion really doesn’t smell that great. Should it be floral? Herbal? Fruity? Earthy? Oceany? None of these spoke to me, because each individual person has his or her preferred scents, and how horrible it’d be to have a gorgeous oceanic fragrance clashing all day with the classic aroma of Chanel No. 5! This isn’t like soaps or lotions, which are designed to layer scent and be the primary for the day. No, face crème should be alone, a silent participant in the wearer’s day, not getting in the way of whatever else she’d like to wear. It was around this time that I discovered Manoi de Tahiti as I was shopping for the ingredients I would need for this extraordinary face crème. 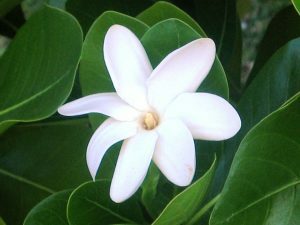 Done correctly, Manoi de Tahiti is an infusion of the gorgeous tiare flower, a varietal of gardenia, in virgin coconut oil. The native Tahitians infuse the flowers in the oil, then change out the flowers for fresh ones – up to twelve times! The result is a lightly floral-fragrant oil that is truly a head-to-toe delight. The Tahitian people use Manoi de Tahiti as a hair treatment, after-sun balm, and a treatment for many different skin conditions. I also read that they use it as a sunscreen, too, which I do not recommend. However one uses this glorious Tiare infusion, it promises to be a delightful skin treat. As my formulation called for coconut oil already, I decided to exchange Manoi de Tahiti for the coconut oil, and that lends its beautiful fragrance in this crème. There are other ingredients to this crème, both all natural and purely synthetic, all granting a specific and significant contribution to the whole. They please me, as does the crème itself. But the Manoi de Tahiti is the piece de resistance of this crème and what keeps me coming back to it every day as my facial moisturizer of choice. When’s a Chemical not a Chemical? Chemicals surround us. They’re in the food we eat, the drinks we drink, and the air we breathe. Our entire bodies are nothing but chemical processes. A couple of weeks ago, the girls and I were in a shop where there was a sign that read, “Soaps – Chemical free!” Mary, my older daughter, quipped, “So they left out the lye?” I returned, “And the water, the oils, and the fragrance.” While the “chemical free” sign may entice unwary consumers, it really felt like the creator of the sign is , at best, ignorant of what, exactly, soapmaking is, and at worst, willfully practicing deceptive business practices (given that artificially scented soaps are labeled “all natural” and have “essential oil” on the label, I lean towards the latter). Soapmaking is chemistry. The very idea of this amuses me greatly, given how hard I struggled in high school and college chemistry. Sodium hydroxide (lye) mixes with water (usually), and that mixture, in turn, is added to oils in liquid form; they are then emulsified together, either by stirring or blending, before having additives added to the raw soap and being poured into a mould. The magic happens here as the mixture creates heat internally which causes the whole thing to gel. This is a super-cool exothermic reaction wherein the beautifully swirled and designed raw soap changes color, smells funky, and looks like really runny, chunky petroleum jelly. It looks like the soap is a ruined mess at this point, but as the hours pass, the soap cools down, revealing the amazing colors and patterns once more. That process is called saponification. Actually, the gel phase is the heart of saponification, a chemical reaction that starts where the lye mixture meets the oils and ends formally at the end of the curing time. While gel phase only lasts 12-36 hours, saponification can last weeks. Chemicals coming together to create a chemical reaction and cause a chemical change. Sodium hydroxide is a chemical – NaOH. So is water – H2O. And oils are as well – the formula for olive oil is C52H96O6. You can separate sodium hydroxide from water, allowing water to evaporate and lye crystals to form (9th grade science fair project). However, once that lye mixture combines with the oils, there’s no going back. The change is permanent and irrevocable. This is the hallmark of chemical change – a chemical reaction produces a change that cannot be reversed. Ahhh chemistry. Well, you may argue, the creator of the “chemical free” sign means no harmful chemicals. What makes a chemical harmful? How natural it is? Cyanide is a naturally occurring chemical element, but I think we can agree it’s very harmful. Sodium hydroxide is a chemical that can be produced from natural processes (pouring water through ashes), and it doesn’t take much – relatively speaking – to dissolve a 300-pound body. Yet, it sometimes appears in cosmetics and pickles. Dihydrogen monoxide! There’s a “safe” chemical. In fact, I add it to every soap, lotion, and cream that I make. Yet, more people die of exposure to DHMO each year than from exposure to all other chemicals combined! Obviously, what makes a chemical “safe” or not is how it’s used and how much is used. A little NaOH or a little salt isn’t harmful, but an abundance of either can cause sickness, death, or complete disintegration. Bottom line, there is no “chemical-free” soap, because all components of soap are chemicals, and the resulting product is soap and glycerin. Artisan made soaps are proof that there is better living through chemicals. Posted on September 8, 2015 Categories Bath and Body, Business and Marketing, CosmeticsTags chemical change, Chemical reaction, chemicals, chemistry, DHMO, soap, soapmaking, Sodium hydroxide2 Comments on When’s a Chemical not a Chemical? Pucker Up at the Soda Shop! We’re zipping back to the corner drugstore and soda fountain with this brand new lip balm collection. Pucker up and enjoy these delicious flavors in scrumptious artisan-made lip balms. Imagine creamy Root Beer, Sparkling Cola and Effervescent Lemon Lime. You can smell the fizz in these balms – the flavors are that amazing! Posted on May 7, 2015 Categories Bath and Body, CosmeticsTags Artisan, Lip balm, Soda, soda shopLeave a comment on Pucker Up at the Soda Shop! Let me introduce you to Sun on the Go sets. We are trying small sets in a convenient vinyl spa bag so they are more travel sized. They can be taken on a plane, yet are able to take just a little bit of space. We aren’t doing shampoo; instead, we’re doing detangling spray, so after a day in the sun, you can brush your hair with ease. The lotion helps after sunburns or tender areas, while, at the same time, you can use it for simply moisturizing your skin. The soap will be good for cleaning sweat, germs and even shells off your skin. You can use it on your face, though we can’t predict how your skin will react, since people are sensitive to different things. The lip balm will not work as a sun screen lip balm, so don’t use it that way. However it will work if your lips are dried out. You can pick these up at the Blueberry Festival this Saturday, 21 June 2014 or order them from our online store if you’re not going to be in the area this weekend. It is three yummy flavors in one sweet little tube! It’s Balms Away! lip balm, a fabulous triple layered treat for your lips. I was looking at the product picture on the listing for these balms, and I was remembering when I had made all these tubes of balm. Two years ago, fellow alumni and I from my high school graduating class got together to put together care packages for troops serving in Afghanistan, and I’d made these for those boxes. These were a lot of work, but so much fun to make! It’s thrilling watching layer harden upon layer, then seeing the finished product emerge. You should grab one of these treats for yourself. First, enjoy a blast of sweet cherry flavor, followed by toasted coconut (delish! ), then finish the tube with blueberry, pumped up with blueberry butter. The tubes of these lip balms just look happy with their patriotic flair. What’s your favorite lip balm flavor, maybe a flavor that takes you back? Posted on April 7, 2014 Categories Bath and Body, CosmeticsTags Afghanistan, Artisan, Blueberry, cherry, Cosmetics, Flavor, Lip balm, Shopping, troops, vanillaLeave a comment on Balms Away! Tomorrow’s the day! Oooh, we’re sooo excited! I simply must make room in the living room – dump peanuts, crush boxes (thank goodness tomorrow’s trash day), pick up some clutter. The cute guy in the brown uniform is coming! He’ll be grateful that this week’s box will be light – mostly lip balm tubes, caps and replacement items from an order mix-up (not like last week’s huge pail of palm oil and some bases). The fairly cute guy in the blue uniform is showing up, too. The poor FedEx guy, though, has to haul up three boxes, one of which containing soap base. Yes, tomorrow is box day. I’ve got shipments coming from two separate suppliers and there will be enough goodies in those boxes to do all sorts of wondrous creating. Lip balm tubes to finish a large order for my private label customer. Strawberry lip balm flavoring so I can make delicious strawberry lip balms for a festival I’m doing in a couple of weeks. Strawberry seeds to go in a strawberry soap I’ll be making. And white soap base to finish a wedding order and to make more flip flops. You bet I’m thrilled! I have a light weekend and will have lots of time to create! I’ll keep you posted on all the new goodies that will be hitting the rack. It’ll be good having some of my old favorites fresh and back in stock. Posted on April 28, 2011 Categories CosmeticsLeave a comment on They’re coming!